Homemade pizzas are trending when it comes to outdoor barbecues! Regular crust, thin crust, deep dish… they are all popular with BBQ grills these days. The great thing about pizzas is that they are easy to share and customize for the whole family. 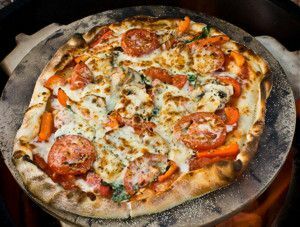 At Rollier’s, we have all of the products that you need to get great-tasting pizza straight from your own backyard! Here is a list of “ingredients” that you need to make the perfect pizza. Any ‘ole BBQ: You are not limited to a particular type of grill when it comes to pizza making. You may use charcoal grills, like the traditional Weber kettle or the porcelain Big Green Eggs. Natural gas and propane grills work just as well. The biggest thing to consider here is the size of the grill. The larger the pizza, the larger the grill you will need to use! However, 15-18″ pizzas can easily fit in most any stand-alone gas or charcoal grill. Baking sheets, pizza screens, or baking stones: It is your choice for what type of pan you would like to use for baking, but there are some advantages to each one. Baking/cookie sheets are simple and something that most everyone has already. Even though these can work okay, they have a little trouble with distributing the heat evenly, since they are so thin. Pizza screens are an inexpensive upgrade when making homemade pizzas. The pizza screen encourages crispy crust and the holes in the pan allow for even cooking. Most of these screens comes with a carry handle, so they are easy to remove from the grill when hot. Baking stones are probably the most expensive option, but they provide indirect, even heating. Because of their thickness, your grill becomes more of an oven. Pizzas tend to take longer to cook with baking stones, but the crust comes off crisp and without unwanted moisture. Accessories: We suggest that you outfit your pizza making with all sorts of bells and whistles… well maybe not bells and whistles, but you might want to consider pizza peels, pizza cutters, rolling pins, special pizza flour, and more. We have some of these products available in our store, but you will find other items available at dedicated kitchen stores.